Kristin Szakos signing the documents shortly after being sworn in by the Honorable Paul Garrett, Clerk of the Charlottesville Circuit Court. Photo taken by Sean Tubbs. 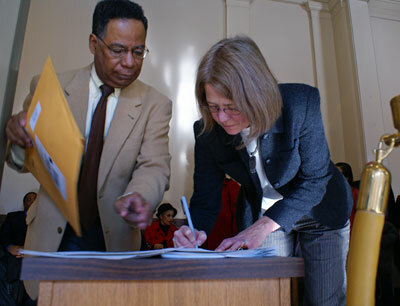 current 14:48, 23 December 2009 400 × 306 (28 KB) Seantubbs (talk | contribs) Kristin Szakos signing the documents shortly after being sworn in by the Honorable Paul Garrett, Clerk of the Charlottesville Circuit Court. Photo taken by Sean Tubbs. This page was last edited on 23 December 2009, at 14:48.